By Eric Olson, vice president of product management and marketing, PureTech Systems. • Accuracy to enable increased revenue, high levels of customer satisfaction, ensure safety of customers and their vehicles and secure customer trust in the system. • Robust capability to operate 24 hours a day/7 days a week in all types of weather and lighting conditions. • Intelligence to understand various types of vehicles, which may occupy a parking space, and not be confused by non-parking objects, such as people or bicycles. • Open architecture to integrate with new or existing systems. • Affordable with use of off-the-shelf sensors and reuse of existing infrastructure. • Flexible installation options to address locations that may have power or communication challenges, or support temporary parking venues through the use or temporary deployments. Many systems exist to aggregate and report on counting data, but the sensors traditionally used to collect that data prove to be either too expensive, too unreliable or difficult to install. Since 2005, PureTech Systems has applied its video analytics expertise to perimeter protection situations. When presented with the problem universities and other large venues were experiencing with parking management, it was quickly determined that video would be a very effective and cost efficient sensor for counting vehicles in these situations. 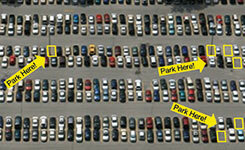 A key component of parking management systems is accuracy. According to an IBM survey, drivers globally spend an average of nearly 20 minutes per trip in pursuit of a parking space. After 20 minutes of searching for a parking space, a customer does not want information that there is a spot available, only to search the entire lot and find that this is not the case. The result is a miserable customer experience and a low satisfaction rating. In addition to keeping constituents happy with the parking experience, businesses with parking management responsibilities also need to ensure people’s safety and protection of their assets. The longer it takes a driver to find a parking spot, the more likely they are to park inappropriately or illegally. This is made worse by the fact that parking issues tend to be governed by the First Law of Compounding Stupidity, which states that if a single person or group does something stupid (as shown in Figure 1) the likelihood of other persons or groups performing similar stupid acts will increase exponentially. Management of surface lots and parking garages is an integral part of many industry business models. Accurately counting vehicles is a key part of managing these assets. Applying counting algorithms to video has proved to be extremely accurate, especially in short-range applications, including parking lots and garages. The higher levels of accuracy over traditional counting sensors greatly improves customer satisfaction, with some installations experiencing daily complaints drop to zero. It allows lot managers to operate at a fuller capacity, which can increase parking revenue and help accommodate the maximum number of potential parkers. Many lots operate 24 hours a day / 7 days a week, in all types of weather and lighting conditions. From a counting perspective, this can be especially problematic for outdoor lots subjected to all types of weather. Similarly, budget and city codes affect lighting coverage of parking areas. Video based counting can accommodate these challenges using such features as background modelling, to ignore environmental factors such as rain, falling snow, reflections from headlights and even moving vegetation. These algorithms operate in conditions where the vehicle can be ‘seen’, which means in most cases, non-specialised cameras and existing lighting will suffice. For no light facilities, thermal and low light cameras have become very affordable options. Video-based counting systems can utilise these sensors in areas with low light, or no light, and provide very accurate counting data. Counting systems must have the intelligence to count only those vehicles that could potentially occupy a parking spot. Another challenge with typical sensors is the ability to intelligently count. They are often confused when encountering different types of objects, including cars, trucks, people, motorcycles or bicycles. For most applications, lot owners are only interested in those vehicles which will potentially take a parking spot (cars and trucks) and ignore those objects which may pass through the lot, but will not impact the number of available parking spots (people, bicycles, etc.). Through a feature called classification, video counting places objects into segments, such as car, person, animal, bicycle, etc. This allows the software to count only those items capable of inhabiting a parking space and ignoring those that will not affect the total spaces available. Parking management spans many industries, including universities, entertainment venues, airports, seaports, hospitals, convention centres and even public offices and municipalities. It stands to reason that each industry has their preferred method to report, display and disperse this information. Video-based counting is a very synergistic approach to this variability, typically acting as a stand-alone sensor providing simple count data to an enterprise system, which then aggregates and communicates the resulting state to operators and potential parkers. Transfer of the data between the counting sensor and the enterprise system is typically XML, but can be as simple as a discrete signal output. The information content of the count can also vary based on the sophistication of the management system, from a simple count to a count with many attributes, such as, object type, object speed, object location, etc. Additionally, the same camera used to provide counting information, may also double as a video feed to the security group. Affordability is a key requirement for parking management systems. Often there are multiple lots or the lots are very large in physical area. When installing a new, or upgrading an existing, parking management system, this can result in considerable costs for servers, sensors, physical and network infrastructure. As mentioned earlier, video-based counting can be very affordable using commercial cameras and the ability to double as a security sensor is an additional cost savings. Cameras also have a huge installation advantage in parking garages, as the cutting of concrete for in-ground sensors can affect pre-stressed concrete and require extensive design work. Counting systems are easily self-contained and deployable to temporary or remote locations. A video-based counting solution also affords a great amount of installation flexibility. This is especially true in situations where the installation of the infrastructure (power, communications, etc.) is extensive due to the size of the parking area, or its remote location. Still other businesses have the need to set up overflow lots, or temporary parking for one-time events or special high demand timeframes. In these cases, installing a camera counting system along with communication capability facilitates a quick and effective means to provide accurate counting for these types of temporary lots. Additionally, moving a counting zone is as easy as making a few changes in the software to accommodate a new zone in an existing camera view, or repointing the camera and defining a new counting zone. Changing counting zones utilising in-ground sensors, or beam-break devices, typically requires uninstalling and then reinstalling sensors at the new zone entrance and exit. It is important to mention that the application of intelligence to video is a fast-growing technology. In addition to counting, a camera enabled with video analytics can likely provide other pieces of valuable data, based on the selected software solution. Some related capabilities include the ability to detect vehicle speed, regardless of the vehicle’s direction of travel or distance from the camera. Furthermore, video can detect stopped vehicles, vehicles in a no parking area, vehicles that have been in a loading zone for too long, or indicate that a person has been loitering in the area for an extended period. 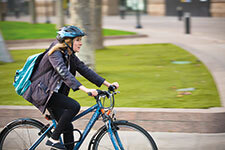 A video-based solution can also help provide trends in vehicle versus bicycle or pedestrian traffic. • Robust in a range of lighting and weather conditions. • Provides intelligence to understand vehicle types. • Is affordable and supports a variety of installation options. • Easily integrates into existing enterprise systems. If your business includes parking management, a video-based counting solution may be a cost-effective option to consider. PureTech Systems is a manufacturer of wide-area perimeter surveillance software solutions including internally developed outdoor video analytics, PTZ auto follow, multi-sensor integration and a map-based (real object size) command and control. With headquarters in Phoenix Arizona, PureTech Systems serves national and international markets.